Is Amputation For CRPS Really A Cure? 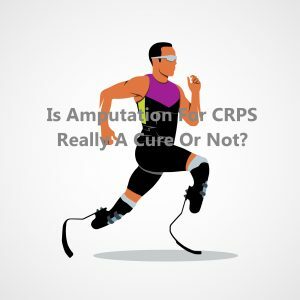 Home » Is Amputation For CRPS Really A Cure? After the huge support of the summer 2016 Paralympics in Japan, the popularity and the sight of amputee athletes using prosthetics often seems to give a degree of hope to sufferers of Complex Regional Pain Syndrome (CRPS) that once lived an active life, now disabled due to the debilitating pain. 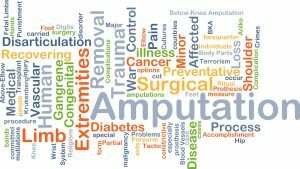 As a CRPS charity we have been asked the question “Is Amputation A Cure For CRPS?” hence the need for this CRPS amputation blog. 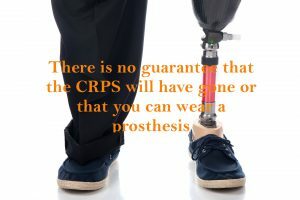 However, what needs to be considered is the potential reoccurrence of CRPS and/or phantom limb pain after the amputation for CRPS can make a prosthesis impossible to use as they cannot even tolerate putting it on. CRPS amputations still remains highly controversial even if the amputation is for the treatment of long-standing, therapy resistant CRPS (Bodde, M.I. et al. 2011). There have been a number of fairly high profile cases of CRPS amputations in over the last 2-3 years in the media, and this has led to other CRPS sufferers also wanting an amputation of their affected limb. But is amputation really a cure for CRPS? Will it actually stop the continuous debilitating pain from the Complex Regional Pain Syndrome? In this blog we are going to look further into the research and specialists opinions on CRPS amputation in patients. Chronic CRPS can be a very debilitating condition and resistant to the range of CRPS treatments that are available. Amputation is always considered as a very last resort for CRPS if at all (Hohendorff, B. et al 2011). However doctors and specialists don’t like to consider amputation as a form of CRPS treatment, even in the most severe cases. This is usually because there is very little evidence available to support amputation for CRPS. All options should be explored for pain control and dysfunctional limb treatment before amputation of the CRPS affected limb or extremity is considered. However, if a patient has long-standing and therapy-resistant CRPS Type 1, then amputation can be justified (Kashy, B.K. et al 2015). In a case report by Finlayson, H & Travlos, A. (2003) they stated that consideration may be given to amputation in patients with CRPS I, if the disease has plateaued and there is a clear indication for improvement of residual function rather than pain relief. The main aim of amputation is usually to increase quality of life and mobility but also to decrease pain intensity (Bodde, M.I. et al 2014). The decision making process for amputation due to CRPS is very different from that for amputation due to cancer or vascular disease. In the latter cases it may be a life-saving option and the only obvious choice, whereas surgeons may have difficulty in deciding to remove a viable limb with CRPS. Remember though that life with excruciating pain and a dysfunctional limb may be even more disabling. You may feel frustrated after trying numerous treatments that have failed and you may believe that amputation is your only option available to you and that it may offer you a better chance, however you must remember amputation only gives rise to the risks of new problems. One piece of research in 1995 studied limb amputation of patients with CRPS and concluded that for the majority they were still enduring significant pain and were unable to wear a prosthesis. In the Dielissen et al 1995 study, the authors determined overall that pain relief was rare and recurrence of CRPS was frequent within the stump that prevented the use of prosthetics. Furthermore, amputation to increase residual function or for severe incurable infection was not universally successful (Pagoti, R. et al 2007). From the Dielissen et al 1995 study it was concluded that amputation in CRPS Type I patients should only be performed to increase residual function or to relieve severe incurable infections. There is no guarantee that after amputation CRPS will no longer be present or even spread to another part of the body. Following amputation, 3 main types of pain have been reported; recurrent CRPS with pain in the stump, pain in the stump without CRPS and phantom limb pain. The risk of phantom limb pain is very high, but there is no certainty that the amputation has been carried out above the level of the CRPS. Many pain consultants seem to believe that in the case of severe CRPS, the risk of recurrence of the CRPS in the amputation stump is high; possibly as much as 50%. In a 2016 study it was found that none of the 19 amputees were totally pain free, the most prevalent pain was phantom limb pain in 89%, followed by 42% who had pain in the stump and 32% of the group had recurrent CRPS in the amputated limb. However most patients had more than 1 type of pain and just 10% resumed employment (Midbari, M. et al. 2016). In another study by Bodde, M.I. et al 2014 72% of the group of CRPS amputees experienced phantom limb pain within the first 3 months. After 1 year they found 86% experienced phantom limb sensations, 71% experienced residual limb pain with a wide range of frequency and disability and 27% had CRPS reoccur after 1 year post amputation. However, although research has shown that many CRPS patients do badly in terms of the recurrence of pain, they were often relieved that the affected limb was gone and was not part of them anymore. People considering amputation often say that they no longer consider the affected limb to be a part of them as we mentioned earlier. ‘To amputate or not’ (Bodde, M.I. et al 2011) explains how amputation may be seen as a chance to get rid of their limb which they see as useless. Instead, this can make the pain worse than was prior to amputation. Alternative treatment methods should be favoured over amputation due to the high risks attached. Guidelines support amputation as a treatment only in the presence of therapy-resistant infection. In general, guidelines warn against amputation because of the high occurrence of CRPS and poor use of prosthesis (Bodde, M.I. et al 2014). There is not only pain, phantom limb pain or sensation and CRPS to consider when thinking about amputation, Szeinberg-Arazi et al (1993) reported that patients with a post-CRPS amputation also require psychological support. The risks are very high and only a small minority are free of CRPS, you could end up in a lot more pain than with the limb and you may not be able to use a prosthesis meaning mobility could decrease even further. The majority of research carried out into amputation of a CRPS limb has poor outcomes for the patients and clearly shows the level of risk amputation carries. 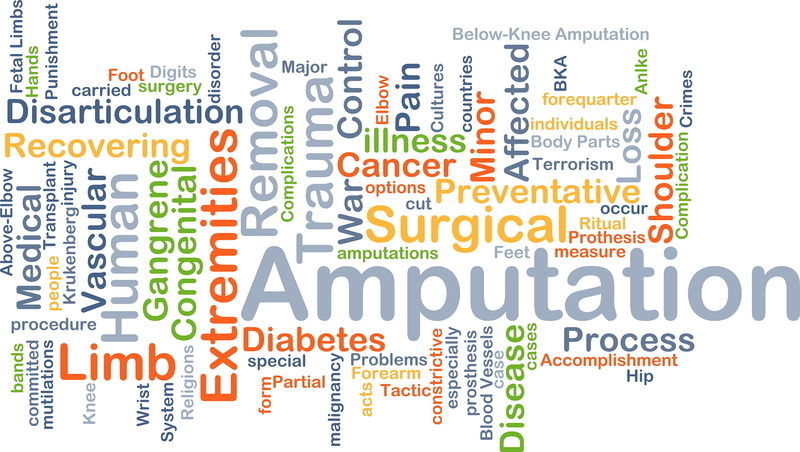 Furthermore, due to these research outcomes and specialist opinions many physicians are unlikely to agree to amputation unless there are extreme circumstances. Why should CRPS patients have to remain in a hopeless and cureless situation with a very debilitating condition? We are certainly not saying that amputation is the only way forward because it isn’t and it is obvious from the research into the area of amputation for CRPS that amputation is certainly not a cure, but maybe amputation should be considered at some point when all of the treatments have been explored and exhausted? What do you think? Is amputation for CRPS really a cure | Should CR[S amputation be considered? What is most certainly obvious is that more research is needed in the area of CRPS and amputation, to help determine which patients may benefit from amputation, level of amputation, recurrence of CRPS-1, patient satisfaction, and level of functional gains post amputation (Kashy, B.K. et al 2015). To conclude, as we said at the beginning, amputation for CRPS is highly controversial due in part to the potential for worsening or recurrence of CRPS symptoms and phantom limb pain, therefore it could be said that amputation is not considered a cure for Complex Regional Pain Syndrome (CRPS). However amputation may be contemplated as a last resort if there are recurring infections, the CRPS is long-standing, retractable and therapy resistant (Kashy, B.K. et al 2015; Midbari, A. et al 2016; Krans-Schreuder H.K. et al 2012). But there is insufficient evidence that amputation positively contributes to the treatment of CRPS (Dielissen et al.1995, Stam et al. 1994). This blog has been written by both Lisa, 1 of Burning Nights CRPS Support’s trustees and volunteer and also by the charity’s Founder Victoria Abbott-Fleming who is a bilateral (double) above knee amputee due to the aggressive symptoms of CRPS. This is a note from Lisa: My name is Lisa, I’m 26 and I’m from the Midlands. I have suffered with CRPS in my right leg, ankle and foot since July 2011 when I was bitten by an insect while on holiday in Wales that triggered an allergic reaction which subsequently became CRPS. At that time I was in my second year of University studying to become a youth worker, I was officially diagnosed in January 2013 and using crutches to get around, I was managing to work at a youth centre as lead youth worker and successfully completed my degree in Youth Work in June 2013. I did a two week in-patient stay at Bath Hospital’s specialist CRPS unit where I made huge progress. In November 2013 I developed my first very small ulcer, by January 2014 that ulcer had not responded to a variety of dressings or treatments and now covered my leg below the knee to ankle. The wounds were severely infected and leaking slough. I was admitted to hospital where I spent 4 months enduring many different treatments and antibiotics until finally it started to heal. I was discharged in June 2014, but by October I was admitted again to hospital because it again had worsened and become severely infected. I spent a further 5 months in hospital and saw a range of doctors from all specialities, none knowing how best to treat my leg ulcers with the CRPS. I was again discharged this time the ulcers hadn’t started to heal but the doctors had exhausted all of their ideas so sent me home. District nurses were seeing me at home and scrubbing my leg every other day to remove the slough, they decided to start using compression bandaging on my leg and thought it could be lymphoedema. The ulcers slowly healed and the dressing no longer being used because it was decided it wasn’t lymphoedema just CRPS swelling. This was October 2016; now the ulcers have again returned and are continuing to worsen. For me, amputation is the only option left in order to stop the ulcers and infections which continuously make me incredibly sick, it’s no longer just pain of CRPS; it’s also my tired and exhausted body fighting infection after infection. 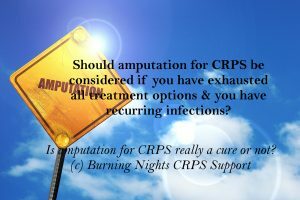 Cited References for Is Amputation for CRPS Really A Cure? Stam HJ, Van der Rijst H. The results of amputation in reflex sympathetic dystrophy of the upper extremity – an analysis of 7 cases,” Eur J Phys Med Rehabil. 1994. Vol 4, pp134–6. 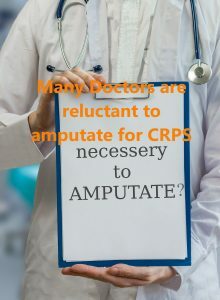 As you can see from our ‘Is amputation a cure for CRPS?’ blog above, amputation for CRPS is extremely controversial and as research has shown many doctors won’t amputate unless the limb isn’t viable and/or there are non-treatable, recurring infections. However there are still many occasions where doctors are faced with CRPS sufferers who have recurring infections and they won’t amputate. So even though the research is lacking in this area of CRPS amputations there is no hard and fast rule of when a doctor will start talking to you about the possibility of amputation for CRPS. If you would like to talk to our founder, Victoria about amputation please either ring our helpline on 01663 795055 or email Victoria direct. Final thoughts – What do you think about amputation for CRPS? Do you think CRPS amputation is right or not? Is there ever a time when amputations for CRPS are right? I had my index finger and a quarter of my hand amputated.This was on my limb that has RSD and the pain was worse.Phantom pain worse than RSD pain. I completely agree with everyone this website is amazing it is brilliant to find so much information about this condition. I just want to be able to walk and get mobile again. It isn’t about the pain I am prepared to suffer that anyway just to get more function in my leg and get my life back on track. I need to know who I should be referred to who may be prepared to amputate despite of the CRPS I would sign a disclaimer if I had too accepting that it is my decision and I accept all the consequences that may arise due to the CRPS. I have been advised by my consultant that he will not operate but have his blessing to get a second opinion elsewhere as he knows how much I want it. It is just daunting that I have to start again and what if I go through it all over again just to be told no! it takes so long. I don’t even think my CRPS is nearly as bad as some of rhe cases I have heard of. My main problem is mechanical and due to advanced arthritis following 3 fusions and 15 operations after a car accident 29 years ago. Thank you for commenting and welcome to Burning Nights CRPS Support charity website! Amputation is certainly a very controversial subject for CRPS and for some people having an amputation may help with quality of life. You are as your Dr has mentioned, perfectly allowed to get a second opinion from another consultant. You can speak to your GP and ask them to refer you to another specialist or to a vascular surgeon who may have knowledge of CRPS. You’re also right that it is a very daunting prospect having to go through a second opinion and it’s something that may or may not help you in the long run and to get what you want. If you are in the UK we can help you search for another CRPS specialist in your area if there are any and if that’s what you want. Amputating a CRPS limb doesn’t always mean that you will be left pain free as our blog discuses and you may be left with not only CRPS in your remaining stump but also other pain such as phantom limb pain or phantom limb sensation. If you’d like to contact us if you are in the UK please visit our contact page. Magnificent website. Lots of useful info here. I am sending it to some pals ans also sharing in delicious. And naturally, thank you on your effort! Just want to say thank you for all of the information. I found it to br both very helpful as well as disappointing as I was hoping to hear amputation would rid me of this pain. I just don’t know how much longer I can deal with this….. Thank you for commenting on our amputation for CRPS blog. I’m sorry that you have been disappointed to find out that having an amputation for CRPS may not did you of your CRPS or persistent pain. If you’d like to contact us if you’re in the UK please telephone us or if you’re outside the UK please email us or visit us on social media so we can help and support you. Hi, my name is Jeanie and I live in South Carolina, USA. My “severe limb trauma” occurred in March, 2010. By Nov. 2010 the surgeon who had put the left leg back together, was screaming and cursing at me as I had “tried to ruin his perfect record” (in surgeries). I left his office broken, terrified and in horrific pain. It would not be until Feb. of 2011 that I would have a doctor say, “Have you ever heard of R.S.D., because that’s what I think you have, but I’m not sure and I don’t treat it, as I am a surgeon”. Again, in unbearable pain and with a leg swollen to twice it’s normal size, I left. The journey has been scary and hideous struggling to find out about a disease that no one knows about, having to fight my own lawyer, other lawyers, employers and pain. My faith is the single point of light and life for me…I’ve lost my home, almost lost my husband and face a world that I can hardly function in. There was a website in the U.S.called R.S.D. HOPE which I relied on but they have closed down due to health issues, Lord love them. So when I found you last night I was thrilled. I hope foreigners are allowed into the group as I have a new computer now and would really appreciate have a good resource. Please let me know if it’s OK for me to be part of your group…I have truly appreciated all of the information and effort that I have seen put into this site so far. Thank you for sharing some of your CRPS/RSD journey with us. Of course it is pk for you to join us or use us as a resource. Please feel free to join our online community forum as we have many different nationalities who post on there. Welcome to Burning Nights CRPS Support! Sometimes I get angry that I was injured by a reckless driver, but I must forgive, but I don’t forget! I’m sorry to read about how you were injured Danny 🙁 I know you can’t forget what has happened because the CRPS pain is a constant reminder. Have you considered counselling or CBT, EMDR etc? We have some blogs about counselling, EMDR and CBT in our blog area for you to learn a bit more about them. We also have a good blog called ‘Acceptance of CRPS’ that you may be interested in as well. We’re here to support you when you need us. Thank you for your kind comments Terri about Burning Nights CRPS Support and the information we provide! Have you checked out our blog on the Dorsal Root Ganglion or DRG Stimulation treatment for your CRPS? The research Study results are certainly very good. It gives better coverage than the SCS and is more pain specific. I just wanted to say a huge Thank you for this brilliant post and all of the comments. The work you are doing is fantastic and trust me it is helping so many of us. It’s so reassuring to know that there are so many of us CRPS type 2’s out there. I myself went through with amputation after 24 yrs being diagnosed (LAK 2yrs ago) my CRPS type 2 has spread since. I have major problems with lymphodaema volume fluctuations (I use an infinite socket (lim innovations)), neuroma’s, bone & phantom pains but I’m still so glad I went through with it. One thing that has surprised me was how quickly symptoms have returned and spread. I’ve been trying to research and ask to see if this was normal for the last year but couldn’t find any answers even from my doctors. (It’s sad & frustrating that still too many doctors just don’t know what crps is and that I have to teach each new GP I meet. Which can be really annoying as some think they know better and tell me “it can’t be that bad! You need to toughen up”) Thankfully after going to Naidex and following your twitter stream I found this post. You have saved my sanity and just had to say a huge… no … a MASSIVE Thank you!!! I’m going to print this out and give it to my GP/ Doctors. As a bilateral above knee amputee I also found that when the CRPS spread to my left leg my symptoms did spread fast. It only took from being diagnosed in March 2014 to being amputated above the knee in December 2014 whereas it took over 2 1/2 years for the first leg to deteriorate so badly it needed to be amputated. Please feel free to check out my story under Our Founder or Victoria Abbott-Fleming. You can find Burning Nights on various social media including Facebook (chronicpainCRPS), Twitter (@BNightsCRPS), YouTube, Google+, Pinterest and LinkedIn. Hopefully you managed to speak to one of the team at Naidex 2017, if not there’ll be another chance to meet us next year at Naidex! If you want to email us we can send some of our CRPS leaflets to your limb centre direct. Hi everyone, I can’t believe there are so many of us suffering from CRPS type 2. I have suffered from it since 2014 due to an accident at work where my right thumb was ripped off. First it was reconstructed and after problems it was removed. Over time I have had 10 different operations and procedures from nerve removal, gangilion blocks,and just before Christmas spinal stimulation, not to mention the different tablets,but nothing worked. The CRPS has affected my whole arm and is completely paralysed. I was referred to a London hospital,the doctor is brilliant. Far more advanced than my local hospital. He explained why I have other symptoms and problems, which include opposite hand not working properly, bad vision in one eye, hearing ultra sensitive. I am now on a list waiting to have my arm amputated, but reading these replies I am wondering what is the best thing to do,at the end of the day the final decision is mine. I just don’t know what way to go. Thank you for commenting on our amputation for CRPS blog. As you say it is totally your decision at the end of it all. As long as you make the decision knowing the pros and cons of having an amputation or not, researching everything and speaking to CRPS amputees then you can honestly say you’ve done as much as you can do. For some people having an amputation for their CRPS is a quality of life choice and even if they can’t wear prosthetics they feel better and have a better quality of life which is also important. Please feel free to give us (Burning Nights CRPS Support) a ring on 01663 795055 if you ever want to talk about your amputation decision. As a bilateral AKA I know how very daunting amputation surgery is. I had CRPS for 3years in my had after accident tor hand ulna nerve severed, after many treatments and pins etc consultant decided to amputate little finger and part of hand,not just for pain but other problems had developed. If amputation could guarantee help with pain it would be an option for all may be. Over the years my CRPS has spread most of all right side, arm opposite hand right lower leg, foot my sensitivity to hearing is remarkably high you may think if your deaf how fortunate I am sadly it is painful, not only that all I meet struggle to hear me as I have to throw my voice to be heard. There are many with worse CRPS than myself,living with the daily pain and when flare like I have had in last 3weeks is beyond words. So for me with daily excerise I can move my hand but I question would the constant pain and spread have happened or worse who knows. Everyone who suffers from CRPS is different. But there are certain elements that all suffer as this can be seen throughout all the stories I read. I can understand the feeling of BPD that CRPS causes the sufferer; as it is that limb causing such pain that will not go away and the mind tries to turn away and disassociate with it to cope with everyday living . CRPS does not give a quality of life, it gives constant pain, ulcers, ill health. I have seen first hand that amputation is not a cure or stopped the pain. But can understand the reasons it was chosen to be carried out. That is, no more recurring infections and a quality of life that is needed to help them through a life coping with CRPS. For each one of you it is different and my heart and prayers go out to each and everyone of you. Whilst you have lows days and high days I see the strength you all have, though you might not see this in yourselves. Thank you Lisa and Victoria for this article and the work you are doing to raise awareness of CRPS. This Is a brilliant article well worth reading very detailed and very informative. I’ve had crps for a number of years through an injury I’m in the process of getting my right leg amputated I’m not sure you can say amputation is a cure but it’s quality of life we want to be able to walk to not keep banging your leg every time you turn your wheelchair in your house and in some cases to decrease pain there is bad and good in all treatments opioids sometimes work but sometimes they don’t nerve blocks sometimes work but not for everyone with crps it’s what works for you. I was diagnosed with CRPS in 1993 following a work injury to my right knee. After numerous treatments the Doctor recommended amputation in 1996. It was clearly stated at that time that this was to obtain a functional improvement and was unlikely to affect the pain. The amputation was carried out AK in 1996. Whilst initially pain free, within a year I the CRPS had reached the same degree of painfullness as pre-amputation and additionally it was exacerbated by phantom limb pain. At that time I was told that there were no further treatment options and that the amputation was a treatment of last resort. According I was advised to learn to live with the situation. Twenty One years later, I have developed sufficient coping mechanisms. The pain is constant and a lot of the time it is severe. I am able to use my prosthetic leg for periods most days and at those times and days when I’m unable to do so I use elbow crutches. Painkillers are ineffective although I still use considerable amounts of prescription Codeine to dull the effects of the phantom pain elements. I was diagnosed w RSD when I was 13yrs old I am now 39. At 21 my leftckeg was amputated due to complications of the RSD. It wasn’t amputated just bc the pain and the RSD. My leg started swelling so bad that I couldn’t walk bc the skin was so tight I started developing ulcers on my leg. I developed cellulitis and was hospitalized on many occasions . I tried every treatment available w no success. My docs were worried the swelling would move up my leg and at 22 it was amputated. I was doing very good I did have phantom pain but the nerve blocks did help that . Unfortunately I was hit by a car which caused the RSD to spread to my arm but thank god the blocks and stimulators helped that. About 6 yrs ago my right leg started swelling even worse then my left one . Again we tried everything available but the infection went to my bone and three weeks ago my right leg was amputated as well . I’m not sure what it will feel like after the actual surgery pain will subside. I’m hoping just like my other leg the blocks and maybe the stimulators will help the phantom pain if I get any . So is amputation a “cure” no but it did help the quality of my life. I pray that continues but I wasn’t able to do anything before the amputations so for me I did make the right decision. We all know everyone is different and I pray for each and everyone of you . I’ve suffered crps for 11 years. Even it was diagnosed in 2006, nothing was done apart from physio and pills. It was only last year in 2016 that I finally got referred to professor candy McCabe at bath and she said if I had been referred earlier then she may have been able to help. She feels amputating my limb would not be beneficial as the crps would spread and mirror. If I was to save up £10,000 then they would amputate but being type 2 stage 3 it probably wouldn’t work. Things are that bad that I’ve attempted suicide several times. I feel let down by the medical profession.